After the most amazingly sunny and beautiful summer in Southeast Alaska, the fall rains are replenishing the rainforest. Moss eagerly soaks up water like a sponge, muskeg ponds fill, forest soil becomes wet and heavy again, and the excess runs into thousands of streams and creeks. My sweetheart and I walk through the forest, stepping over brooks, jumping a small stream, and finding a bridge to cross a creek. The one above is unusually easy; straight, level, limbless, with moss for traction. Moss can be slippery, but bare, wet, slightly rotten wood is like walking on an oil covered pipe. This bridge is low and the creek is the right depth. If I fall in then I just stand up and walk my cold, embarrassed self out of the creek and out of the woods. Haven't had to, yet. Nearby muskegs and logs in the stream release tannins, turning the water tea-colored. It is not harmful. The log bridges are welcoming access to more of the forest, making secret trails to the best fishing holes and roads for wildlife and people. They are temporary; an opening in time between the stream undercutting a great tree and its reclamation by seedlings, fungi, microbes, and gravity. My sweetie and I have been walking bridges while mushroom hunting lately, and it makes me think about the connections. I've also had mushrooms on the brain for weeks now. The mushroom is just the reproductive part of the fungus, like an apple is to a tree. There's a whole lot going on with the fungus underneath. The love of my life walks a bridge with young trees growing out of it. The forest is full of bridges that we can't see. Trees live as much or more in the soil as in the air, and they have intricate relationships with other organisms there. Humans have known for a long time that some fungi trade nutrients with trees in a mutualistic mycorrhyzal relationship. In a very simplified explanation, the fungal mycelium give the tree rootlets minerals and water, and the tree gives the fungus sugars. A tree may form partnerships with one hundred different fungi at one time. The fungus forms a network of mycelium throughout the forest floor and in decaying wood and leaf litter. Threads of mycelium on a log where the bark had fallen off. When Kate Mohatt was in Wrangell giving a talk on mushrooms, she mentioned that research is showing that mycelium can facilitate communication between trees. She gave an example of a tree being attacked by an insect. That information can be sent via the mycelium to other trees so that they would be notified to start producing chemicals to repel the insects. An intra-forest cellular network. Forest 911 hotlines. Underground bridges. A forest as one organism made up of many. This network is everywhere in the Tongass National Forest. 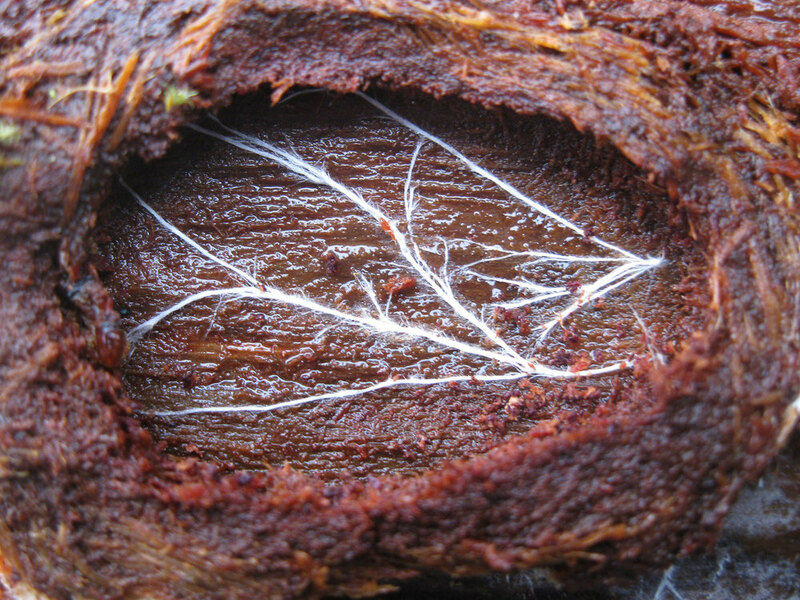 Peel the rotten bark back from a log and there are the hairlike strands of mycelium. The mushroom sprouting out of the ground is a sign of the organism living beneath our feet. An organism that makes a living mining and selling the minerals and water, and then being paid in carbohydrates. Does it charge for being a messenger also? Or is the communication self-preservation? If I were a fungus and spruce beetles threatened my livelihood I would try to get the word out. Roots of trees interwoven with each other to make the entire stand more windfirm in the shallow soil. Branches reaching for sunlight, filling gaps and giving squirrels sky bridges. Silky filaments of spider webs connecting a berry bush to a devil's club leaf so that both feel the passing of a deer breaking the connection. Through it all there is the dendriform pattern of the creek that I just walked over branching into the brooks and rivulets that feed it, and those in turn being fed by today's drizzle in this temperate rainforest.